The savory sausage and bold peppers will take your taste buds on an exciting roller coaster ride. Every bite of this dish is bursting with flavor! 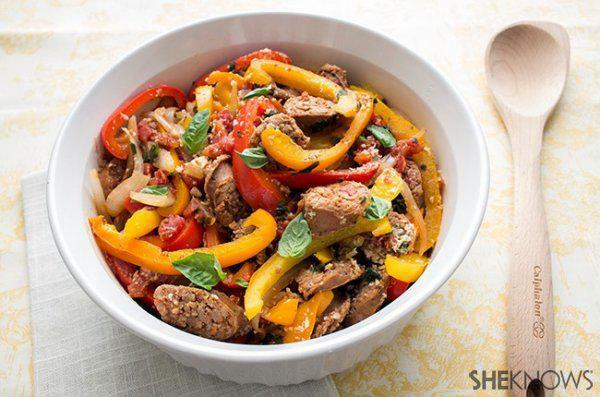 t Italian sausage and peppers is a traditional Italian recipe that’s often loaded with excess fat and calories. To enjoy the traditional flavor with a skinny twist, we cut the excess fat and created a lower-fat version that is especially great when you’re looking to make a low-carb, high-protein dish. You can also use this recipe to rev up your next-day lunch by making an extra serving with which to load up a low-carb, high-fiber wrap. Hello, delicious! Preheat the broiler. Pierce the sausages all over with a fork, arrange them on a baking sheet and broil for about 8-10 minutes, flipping halfway through. They should be golden brown but won’t be fully cooked. Transfer the sausages to a cutting board and cut 3/4-inch pieces on the diagonal. Meanwhile, heat the olive oil in a large skillet over medium-high heat. Add the bell peppers and onion. Cook until the onion is slightly golden brown and the peppers are soft, for about 5-8 minutes. Add the garlic, rosemary, red pepper flakes and salt. Cook for 1 minute, continuing to stir. Remove the pepper mixture and place it in a large serving bowl. Add the diced tomatoes, water and basil leaves. Add the sausage and reduce the heat to medium. Cook until the sausage is done, for about 3-4 minutes. Combine the sauce and sausage with the pepper mixture and stir until everything is evenly coated. Garnish with basil. Nutrition information per serving: 368 calories, 19 grams of fat, 1,497 milligrams of sodium, 12 grams of carbohydrates, 5 grams of fiber, 5 grams of sugar, 32 grams of protein, 9 Weight Watchers points.